Three species of wolffish occur in eastern Canadian waters: northern wolffish, spotted wolffish, and Atlantic, or striped, wolffish. Their looks have often inspired fear. 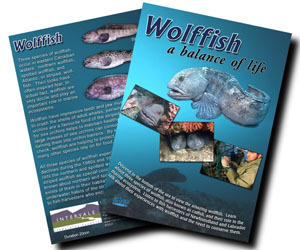 In actual fact, wolffish are very docile and play an important role in marine ecosystems. 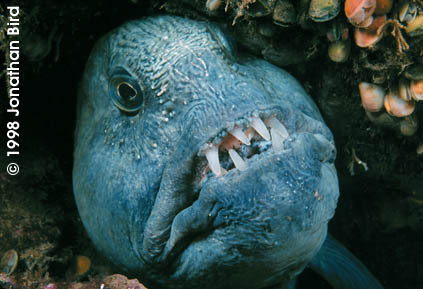 Wolffish have impressive teeth and jaw muscles that enable them to crush the shells of adult whelks, periwinkles, and clams. Sea urchins are a favorite food of the striped wolffish. This preference for sea urchins helps to maintain healthy kelp ecosystems, since large masses of sea urchins can consume whole beds of kelp, turning them into urchin barrens. By keeping urchin numbers in check, wolffish are helping to protect an important ecosystem that many other species rely on for food, shelter, and nursery habitat. All three species of wolffish experienced serious population declines during the 1980s and 1990s. Canada's Species at Risk Act lists the northern and spotted wolffish as threatened and the striped wolffish as special concern. This DVD takes a look at the underwater habits of the striped wolffish and introduces the viewer to fish harvesters who encounter wolffish at sea. Produced by Intervale Associates Inc. (www.intervale.ca) with the help of Vidcraft Productions, Government of Canada Habitat Stewardship Program for Species at Risk, Bonne Bay Marine Station, NewfoundSea, and Jonathan Bird Productions. For ordering information, contact Intervale or email info@intervale.ca. The Atlantic wolffish occurs in the Gulf of Maine and eastern Canadian waters. Its numbers have declined, causing the Government of Canada to list it as a species of special concern. The Spotted and Northern wolffish are listed as threatened. This educational film introduces viewers to these amazing fish and the fishers who encounter them. 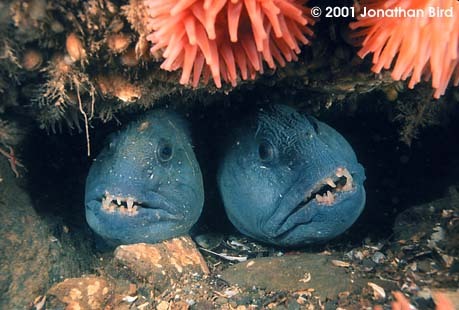 A pair of wolffish in a den. For ordering information, contact: Intervale Associates, Inc.